“The EDL kicked off their year with a poorly attended short walk from Slough train station to the High Street and back again, on Saturday. They had very visible and vocal opposition all the way as locals and antifascists let them know that they were not welcome and attempted to block their march route. The Worcester & Bromsgrove EDL divisions were spotted arriving in Slough in a coach hired from the Bromsgrove Bus & Coach Co. These divisions are to host the next EDL ‘national demo’ which is due to be held in Worcester on 22nd March 2014. Antifascists are organising to oppose them. 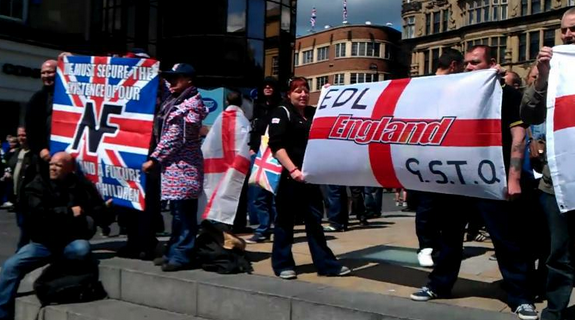 The EDL had a less than successful time this weekend. On Saturday, Tommy Robinson of the EDL held what he called a charity walk but which was in fact a bout of shameless self-publicity and a media grab that fed his nasty little ego for another week but failed to give a much needed boost to his failing and splintered organisation. Tommy had applied to plod for permission for his ‘Charity Walk’ which Scotland Yard denied and told him in no uncertain terms, in a widely distributed document, that he would be arrested, if he entered the East End. Here’s a tip: if plod issues a letter telling you they will arrest you if you do something, and you do it, don’t complain when they arrest you. By doing precisely this Robinson got his weekly media fix and so he could disingenuously claim to be some sort of martyr. As opposed to a serial criminal with a long police record. When Robinson contravened the order and was promptly arrested he was luckily accompanied by several TV camera crews all vulturing over him for some easy pickings. Robinson had said he was going to walk from Marble Arch to Woolwich via the East London Mosque to ‘commemorate’ Lee Rigby the soldier who was murdered recently. Apart from the fact that it was highly unlikely he could manage more than a couple of miles, what an inflammatory trip via the mosque had to do with Lee Rigby’s ‘memory’ is anyone’s guess. 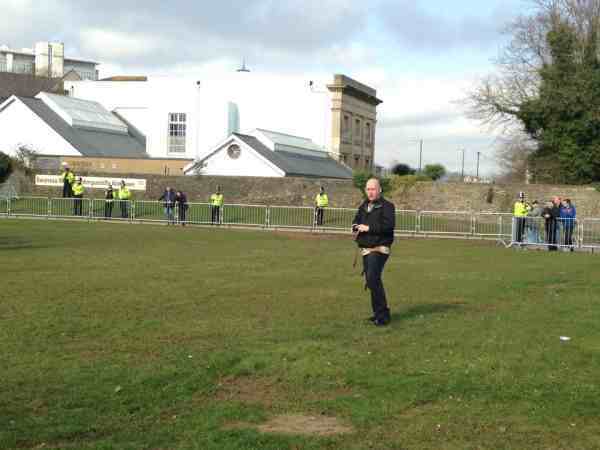 The little Muppet set off with cousin Beaker and was shadowed by 3 plod vans and our intrepid reporter from EDL News. After barely 10 minutes they stopped off for a McDonald’s – which shows they had no intention of doing the full stretch: greasy fried food is not good for long distance walking. After stuffing their faces they set off again only this time losing their rather overweight cameraman who couldn’t match their bovine pace and dropped further and further behind. We eventually saw him again in Woolwich getting a parking ticket outside Wetherspoon’s. Well done. As the Muppets entered Aldgate there was a confrontation with two anti-fascists which caused Tommy to start whining ‘arrest them! arrest them!’ as the police arrested him. This film shows that KKKev hit out first. Robinson was dragged off to the plod van where his vain delusions of martyrdom could hatch. In case you don’t know, the charity for which he was embarrassing had rejected him and the EDL’s money as toxic (Help 4 Heroes also rejected EDL money) so his march was not for a sick girl but for a sick boy desperate for column inches. The Rigby family have also publicly distanced themselves from Robinson. Meanwhile, we headed off to Woolwich where the Armed Services Day was in full swing. After searching the area we came across a group of 20 anti-fascists but very few EDL. As we headed back into Woolwich we found the EDL unsurprisingly kettled by plod in Wetherspoon’s. They didn’t get the chance to lay flowers in memory of Rigby as the Army barracks didn’t want them hijacking the day and so their mission completely failed. Instead, they did what they do best: got pissed on cheap lager. Well done. So all in all not a great day for the EDL: leaders arrested; followers denied laying flowers; poor turnout and all round recrimination from right and left for Robinson’s shameless hijacking of Armed Forces Day, Rigby’s murder and the little girl’s charity with even some halfwit bugles from the far right Casuals claiming that he is a ‘f***ing attention seeking, money grabbing parasite.’ Well said you wee arsespangle! As was intended the EDL foot and mouth soldiers immediately started whinging, claiming that the police were enforcing Sharia law – which was almost as good as when they referred to David Cameron as ‘a cultural Marxist’ (whatever that means). The EDL balloons also claimed that Whitechapel is a ‘no-go area’ for non-Muslims. Sorry fellers but anyone who cares to stroll up Brick Lane for a fine salt beef bagel, stop for a pint in one of the many bars or perhaps even do a wee bit of shopping in Spitalfields will tell you that this is a blatant and absolute lie by made up by people who have obviously never even been there. Despite Robinson getting plenty of publicity this week, the EDL completely failed to mobilise any significant numbers on the day or indeed organise much beyond a round at ’Spoons. Be seeing you! Shoppers at the Touchwood Centre in Solihull looked on in horror this afternoon (Saturday) as the EDL far right extremists waved flags and shouted anti-Islamist chants as they passed by. Pav Sehra, 22, from Solihull, saw the commotion as she left the main shopping area and saw the protesters at Brueton Gardens, on Warwick Road at around 1pm. She said: “I think it is ridiculous. The demonstration was organised by Matthew Pile, who runs the EDL Birmingham Division’s blog and is based in Sutton Coldfield. Members came from as far as south east London to take part. A member of the Birmingham Division, who was acting as a security for the EDL on the day, said: “We have liaised with police and the police have liaised with us. “We were expecting around 50 people to turn up but we’ve got a few more than that. West Midlands Police said that they were aware of the demonstration and would be deploying officers to the area. Right wing extremists from the British National Party said they did not want to be associated with the event. BNP member Ian Stock, from Sheldon, called the Sunday Mercury to distance himself from the rally. He said: “They have just sent me a text message saying they are holding an demonstration against Islamification in the West Midlands. “We do not agree with anything they are doing today. Mr Stock was referring to violent scenes in Dudley as the EDL protested against the opening of a mosque there in June 2010. Several people were injured when bricks and metal security fences were launched at riot police and 21 arrests were made. Violence flared as United Against Fascism staged a counter protest at the same time. A 16 year-old girl suffered a broken leg and six people were knocked over “like skittles” by a car fleeing the far right protesters in one demonstration. Shops in Dudley had closed early and some boarded up windows as the EDL demonstrators descended on the town. Let’s defend ourselves against the English Defence League! The EDL are marching in Bristol on the 14th of July. The counter- mobilisation is in full swing, so get involved. There have been alot of posts on Bristol Indymedia about the EDL demo. There are many many ways to show your opposition to the EDL: don’t let them march, don’t give ’em a lift in your taxi, put posters up in shops, don’t serve them drinks, raise awareness about their farcical attempts to disguise their homophobia, chat to work colleagues, decorate the city…. do whatever you feel comfortable with but now is the time to get a crew together and take action against racism in our city. We want to meet them at the station to stop them marching for any distance. We will resist them wherever they turn and we will be watching them. 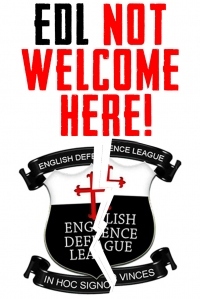 Let’s defend ourselves against the EDL! Zero tolerance of fascism on our streets. 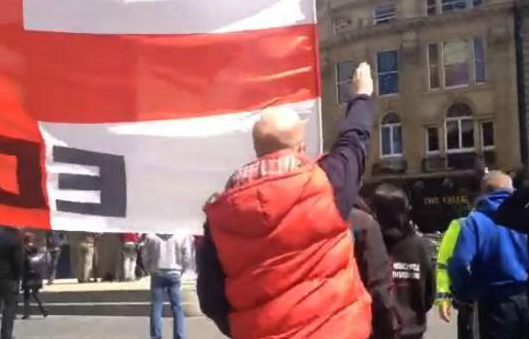 “English Defence League members celebrated the Queen’s Diamond Jubilee this weekend by throwing Nazi salutes after they turned up at an alternative Jubilee event in Newcastle upon Tyne city centre. The attack, organised by EDL North East regional co-ordinator, Alan Spence and his friends from the National Front took place near the Monument and Sky News ran footage of firecrackers and bottles being thrown at families attending the event. Our picture (above) shows EDL members standing alongside National Front members who are displaying a flag with the Nazi insipred ‘14 words‘. Spence has recently been released from prison on licence for an attack on a non existent meeting by the SWP at the city’s Irish Centre. 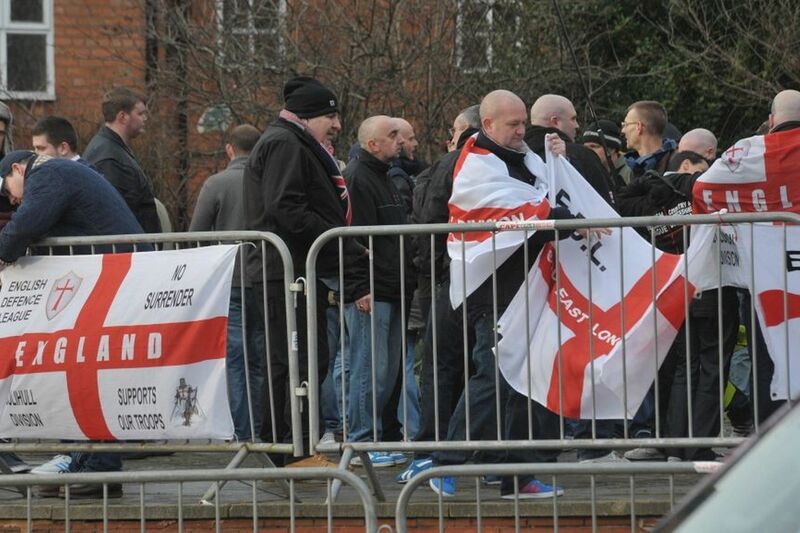 Spence is thought to be the link between the English Defence League and other neo Nazis in the North East. Footage from Sky News clearly show EDL members sieg heiling as abuse was shouted and objects thrown which goes along way to disproving their claims that they are not a racist organisation. Report taken from EDL News.